I’m meant to have short hair. I’ve known that for a long time. Even when I had long hair, I kept it in a ponytail most of the time. Short hair is versatile and sassy, and if you don’t like it, you can change it pretty fast by chopping more off or letting it grow for a few weeks. I’ve been toying with the idea of having a different hairstyle for awhile now, and even when I try new things, it defaults back to my standard style after about a month or so. My friend suggested that the reason this probably happens is because my hair is so short that there’s a limit number of things I can do with it. He challenged me to let my hair grow until the end of July. I’m usually in the salon every six weeks, so letting my hair grow for three months will be a commitment. He may be right and so I have accepted the challenge. And this is going to be a challenge for me. I don’t like having hair in my face or having the sides so long that they can tickle the insides of my ears. And I hate the grow-out phase when I’ve grown my hair completely out in the past. It’s awkward when it’s too short to pull back and too long to do anything with. I suspect I’ll be rocking bobby pins or a headband by the end of this adventure. There have been a lot of pretty short hair styles I’ve considered over the years. The longest one I liked was Shannyn Sossamon’s hair in 40 Days and 40 Nights. Recently I’ve liked Jodie Foster’s hair in Elysium, and Charlize Theron was breathtaking at the Oscars this year with her short pixie. 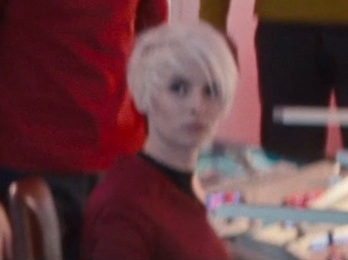 There was also a nameless bridge officer on Star Trek: Into Darkness with short platinum blonde hair that looked so good I’m contemplating changing the color of my hair as well as my coif. I’m curious to see what style I end up selecting for my first haircut once this is over. There are so really cute styles out there, but a lot of them have bangs that can easily hang over your eyes. That’s impractical and it’s the type of thing that will make me crazy when I’m stressed out. If I go with a sassy style like this (and I might because it is that cute), I’ll have to have a headband that lives on my desk so I can whip my hair out of my face when I need to get work done without any distractions, including my hair. 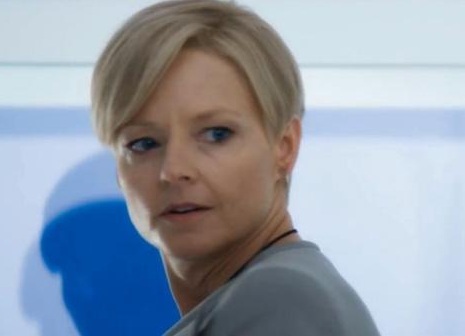 UPDATE: My friend appears to have identified the nameless blonde bridge officer from Star Trek: Into Darkness as Jodi Johnston and found a clear picture of her.